Inclusions: Expert, English speaking guide service, and taxes. On our private Rome tours, you will see some of the most important sights of Rome including its famous squares: Piazza Venezia (Venice Square), Navona Square, Farnese Square, Campo dei Fiori, Pantheon, Colonna Square, Fontana di Trevi, Spanish Steps Square, Popolo Square. Our private Rome tour will also take you to the largest square in Rome, Piazza Venezia. Here you will see Palazzo Venezia, the headquarters of the Fascist party and Mussolini, as well as the Vittoriano, a huge monument dedicated to the first Italian King, Vittorio Emanuele II. Your private Rome tour will continue to elliptical Navona Square which was built over the ruins of the ancient Domitian Stadium. Here you will see one of Bernini’s most celebrated works: the Four Rivers Fountain, representing the four most important rivers known in the 17th century. 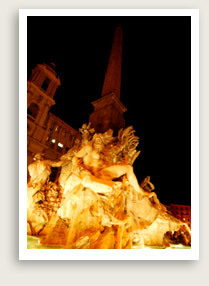 Your Rome private tour continues with your private tour guide on to Farnese Square. The elegant palace of the same name here has been the seat of the embassy of France in Italy since 1874. You will continue on to Campo dei Fiori, today known for its morning flower and vegetable market and lively restaurants and bars at night. A philosopher was burned here at the stake for heresies against the Catholic Church. Your Rome private tour guide will next show you the Pantheon, Italy’s best-preserved dome and the biggest in Europe until the Renaissance, and Piazza Colonna (Place of the Column). The Palazzo Chigi, the residence of the Prime Minister, is located off Piazza Colonna. Next you will reach the enchanting Trevi Square, home to the famous Trevi Fountain, where you can toss a coin for good luck. Time permitting, your tour guide can give you some time at your penultimate stop, the Spanish Steps square, to enjoy some of the best shopping in town. The last stop of your private Rome tour will be Piazza del Popolo, one of the most elegant squares in Rome, with its obelisk, the Twin Churches, and the famous Trident formed by the three streets converging here: Via del Babbuino, Via del Corso, and Via di Ripetta.